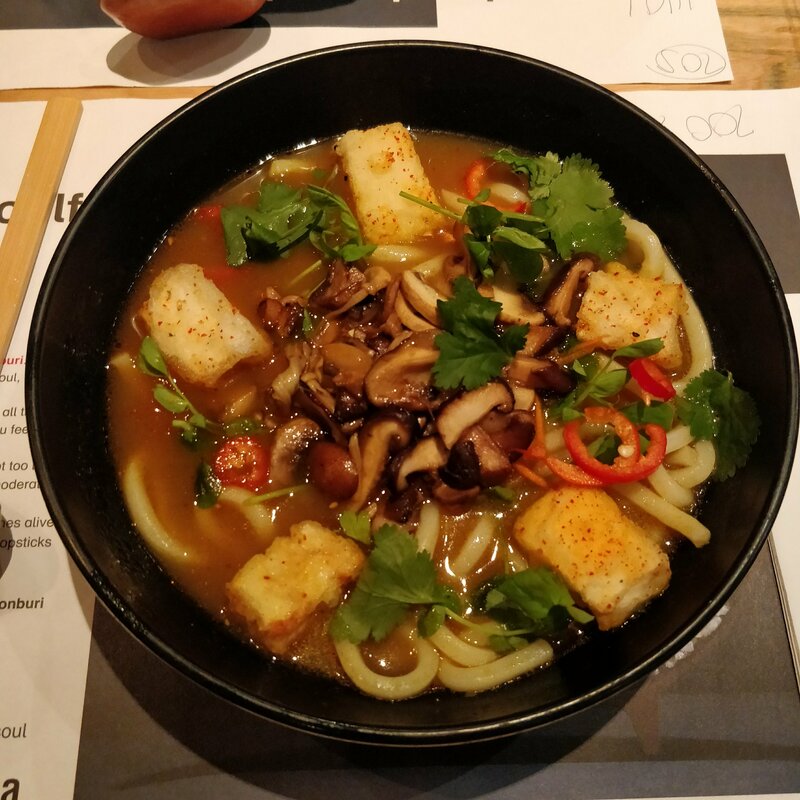 I was really pleased when I saw Wagamama were introducing a vegan menu and my Husband and I decided to visit the Stratford Westfield branch for lunch on our way home from my in-laws this weekend. Wagamama have always been quite good with vegan options if you knew what you were doing, some dishes you need to remove the egg or change the noodles so it’s nice to see them put together a full menu suitable for vegans. I’ve already tried most of the dishes on the menu so I was excited to try the new kare burosu ramen. When the dish arrived (sooner than our drinks) I thought it looked really nice and tasty but we were soon disappointed. The fried tofu was really cold in the middle and when I say cold it was refrigerator cold! We called over our waitress who apologised and took it back to the kitchen. Then another member of staff returned to our table with our food and said the tofu was prepared in advance and then added to the broth to warm through, we were asked if we wanted to order a different dish as if they re-did the ramen it may come out the same. We thought this was a bit odd and would not expect a dish that contained fried tofu to be this cold. We went with the same dish but the results were the same which was a shame as the rest of this dish was really nice. We weren’t asked whether the second dishes were ok and by this time we really hungry so we just ate, paid and left. This was not what I usually expect from Wagamama and I do think this was a one off so I would return. I would be interested if anyone else has had the same experience with this dish and have fedback to Wagamama via their website that if this is how they intend to serve the dish the tofu definitely needs to be in smaller pieces so actually warms through to the middle. We have passed your feedback to our food development team,about the warmth of the tofu and the size of it. I can confirm the fact that the tofu,is indeed, prepared first thing in the morning,in fresh oil,because otherwise we would risk cross contamination and the dish wouldn’t be 100% vegan as we are not a completely vegan restaurant. This is something we are working on developing, and we do apologise again that your meal was not the usual standard we expect from us. They also gave me a £20 gift card to make up for it. Have you tried Wagamama’s new vegan menu? What did you think? Let me know in the comments below. How disappointing! I wouldn’t expect a fried tofu dish to be cold. They should fry the tofu to order!